Make an upscale impression for any occasion by sending them this beautiful wine gift basket. The Robert Mondavi Private Selection Traditional Trio features three of the most popular wine styles. 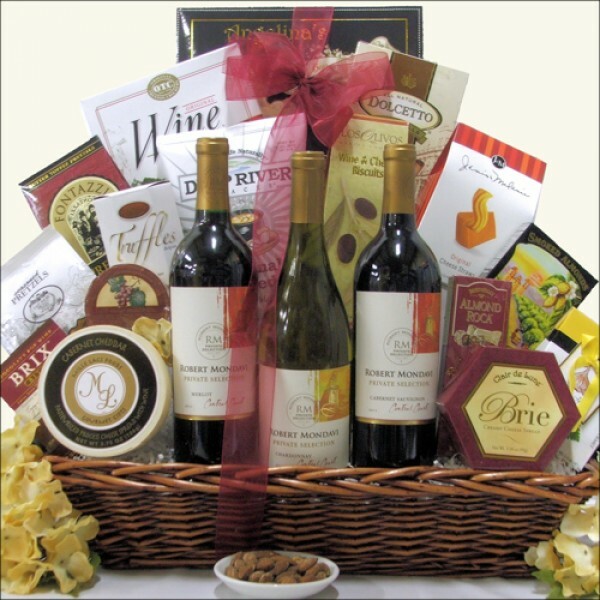 We have included a smoky oak and rich Chardonnay White Wine, a fruity and full Merlot Red Wine and a berry and smooth Cabernet Sauvignon Red Wine and paired it with an assortment of Cheeses, Crackers, Snacks, Cookies and Candy. A great gift that they will enjoy for days! ...in a Rectangular Dark Stained Gift Basket with Side Handles.